Get ready to jet-set with the domestic or international. Many brands made from gorgeous Italian leather mixed with a durable canvas to basic durable nylon.Designed to meet international carry-on regulations, Some can hold all of your overnight essentials in addition to your laptop, iPad, and files. From New York to London, Paris, Milan, Tokyo, Hong Kong, you'll arrive putting your best foot forward in these versatile bags. 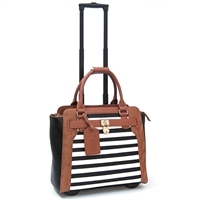 This Sally Stripe airplane carry-on size Executive Rollerbrief, a smooth faux leather beauty with front and side pockets. This Color Block airplane carry-on size Executive Rollerbrief, a smooth faux leather beauty with front and side pockets. Looking for a special wheeled briefcase? Please don't hesitate to contact us with any questions.